The third in the Lovely series, out this Summer. 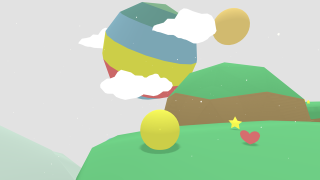 Lovely Planet Arcade, the sequel to colourful first-person platformer Lovely Planet, did things a little differently to its forbear: it ditched the y-axis, and made it so that projectiles worked via the instantaneous 'hitscan' method rather than via slowly moving physical missiles. It seemed to be taking things back to the days of Doom, when you didn't have to worry about looking up or down: a source of much anxiety in this modern, multi-level world of ours. According to the official site, Super will be the last game set on Lovely Planet, and it will be just as systemically pure as the previous titles, boasting no other powers than the humble jump button. It will also feature NPCs, allow you to revisit "iconic" locations from previous Lovelies, and kill you lots and lots. I do enjoy a good 3D platformer, and I'm glad to see Super Lovely Planet join the ranks of Poi, Yooka-Laylee, and A Hat in Time—man, 2017 is the year of the 3D platformer, isn't it?